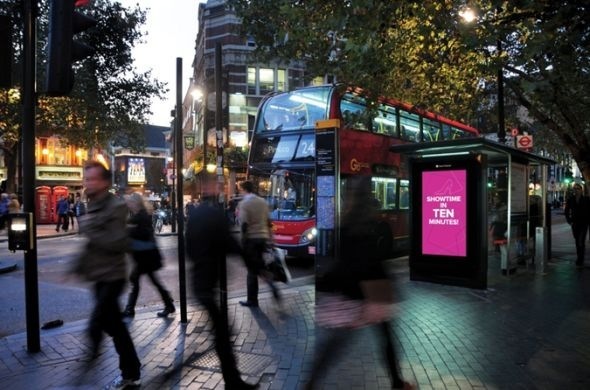 The UK will soon see its first network of roadside digital street furniture installed in London, meant to enhance the Immediacy, Context and Interactivity of the outdoor advertising messages. According to Clear Channel, the goal of this network is to enable advertisers create a complete brand experience for audiences on the move (commuters, shoppers etc.) and bridge the online and offline environments– from downloading vouchers to use in a nearby store to learning about a show to attend in a nearby theater. The bus shelters, where 80% of the screens, are located represent a high dwell time location, where consumers are waiting and are thus able to digest the messages & to act based on them. 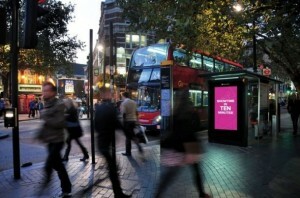 Day and night London’s consumers will be offered time- sensitive, location- based ads and news offering advertisers ”A New Way to Talk to London”. Leveraging the power of digital- out- of -home Clear Channel’s network (LD6) will reach a population of 10.8 million/ week via 100 HD screens situated in key locations across the capital such as Shopping Centres (Oxford Street, Upper Street, Victoria Street etc. ), Entertainment sites (Cambridge Circus, Camden High Street), Transport Hubs (King’s Cross, Euston, Victoria) and Affluent Residential Areas (Wandsworth, Hammersmith, Islington and Westminster). This entry was posted in News and tagged advertising, digital signage by Dynamax. Bookmark the permalink.